In the end, FC Goa's season ended in Bhubaneswar on Saturday, with the club being ISL runners-up, and champions of the Super Cup. But, really, it could've been anything Goa wanted. Sergio Lobera's men were the best footballing side in the land - deep down, even every Bengaluru FC fan will tell you that. Lobera's Goa are an exhilarating side to watch, and when they are at their best, it is near-impossible to stop them. One could argue then, that just on the basis of conceding one goal in 300 minutes of football against Goa, Bengaluru were deserving champions of the ISL, but something that is not up for argument is that this Goa side deserved silverware - it wouldn't have been fair otherwise. Well, sport isn't always fair. It doesn't remember the second-placed teams. 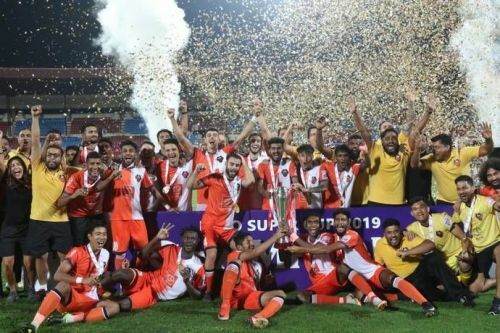 Just for that, FC Goa's 2018-19 season had to end with a trophy. Their season had to be remembered. If the Super Cup champions is what they're remembered as - then, so be it. But, what was special about this team? Why do they have to be remembered? I'll let Lobera take you through that, with a quote from one of his press conferences earlier in the season. "I think football... we have to take care of it. Apart from the fans enjoying the victory, they have to enjoy the way you do it, too"
Watching Lobera's Goa play football is an experience - one that is high on the aesthetics, always brimming with entertainment. But at the crux of it, lies a bunch of players given all the freedom to express themselves. A bunch of players, who, have all been lulled, hypnotised by Lobera's methods. A bunch of players who have immersed themselves into their coach's style of football. A bunch of players who are a bunch of supreme entertainers. Right underneath all of that lies Lobera himself, allowing his players to make mistakes. If taking risks in the attacking play means Goa left themselves a little bit more open defensively, the Spaniard didn't worry. They had a rookie goalkeeper for a good part of the season. He was learning the tricks of Goa's passing-out-of-the-back trade. Mohammed Nawaz made mistakes - quite a few of them. Amidst his frequent superb saves, there lay basic errors while the ball was at his feet. Lobera really didn't care. He defended Nawaz with all his life. The youngster didn't make mistakes, he said, the mistakes were his, for asking Nawaz to play out from the back. At the end of the season, only Francisco Dorronsoro bettered Nawaz's passing success rate of 80.3%. They say the numbers don't tell you the whole picture, but in the context of this Goa side and how different they are, one set of numbers tell you a story. The top three passers of the ball in the 2018-19 ISL were Edu Bedia, Lenny Rodrigues and the metronomic Ahmed Jahouh. There's a joy to watching Jahouh pull the strings in Lobera's midfield. And apart from all his excellence on the pitch, Goa's signing of Jahouh is a lesson in itself to ISL clubs - trust your manager. Having already played for Lobera at Moroccan club Moghreb Tetouan, Jahouh knew what Lobera wanted. He was designated as the man to carry the team, while the others, especially the Indians learned the intricacies and made mistakes. Of course, the mistakes were fine, Lobera didn't care. He feels a sense of debt to ensure nobody that watches his side play should go back with their money's worth not being given on the pitch. And in trusting their manager and immersing into his methods, Goa have quickly become one of the ISL's model clubs. 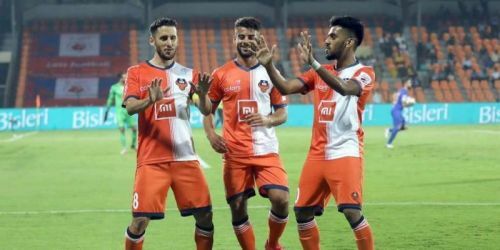 In a still-emerging league with clubs still taking baby-steps, the Gaurs, along with Bengaluru FC have shown the need for trust, faith and continuity. The managerial merry-go-round doesn't help. Lobera himself has evolved. From the man who almost ignored the defensive aspect of the game last season, he's positioned himself as someone who got the balance between the thrilling attacking football and defensive solidity just right. They did have the most number of clean sheets in the ISL. That shows a man hungry to learn, hungry to evolve, hungry to ensure his team's continuous improvement. "Maintaining a clean sheet is not something we are obsessed with. What I'm obsessed with is the goal difference. I would always prefer to win 5-2 rather than win 1-0. That's a goal difference of +3 compared to just one." And yet, it was a switch from Lobera that helped the defence cement their authority. Carlos Pena was moved to centre-back, Mandar Rao Desai became the left-back, and Goa suddenly were a transformed side. None of this meant Lobera went away from his ethos, though. He just saw that Chinglensana Singh and Mohammed Ali were struggling, and made a small switch of personnel. Goa still treated football well, Goa still entertained. They still scored more goals than any other ISL club through the season - outscoring Bengaluru, who had the second most goals, by seven goals. What does the future hold? More of the same, really? Lobera is staying on - and so is the core of the squad. Jahouh, Hugo Boumous and Edu Bedia have signed extensions too. Their hitman Ferran Corominas and Pena are both said to be close to new deals as well. This Goa side, next season, could well become scarier. The thought that could become better is scary, because of how good they already are. Sergio Lobera and FC Goa don't want to stop here. They want to keep taking care of football. They want to keep giving the Fatorda faithful reasons to enjoy them - not just their wins, but their way of winning. The Super Cup triumph was a validation - when you treat football well, at some point, it will reciprocate.